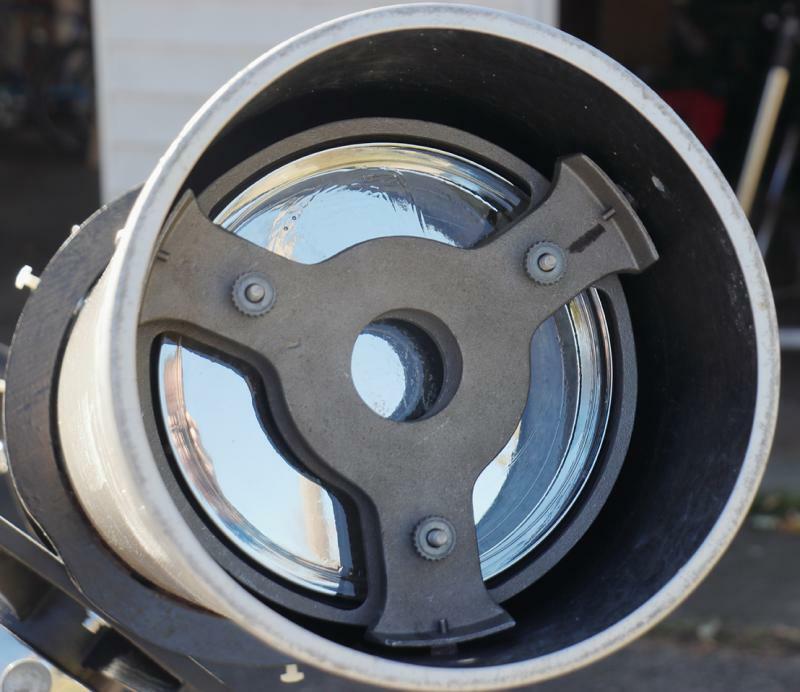 But the 8-inch f/8 reflector is what I'd like to write about now. I'll post photos of it below. It's looking really great, I think. Though I have not done anything like the restoration work that some of you artists have, I don't think it needed much to get it in showy condition. My wife says all the shininess reminds her of her sister's 54 Chrysler. Everything is working fine on it: the mount is balanced well, and tracks beautifully. I got stunning views of the moon a week or so ago, and saw more detail than I expected on Mars a few nights ago, even with pretty lousy seeing. 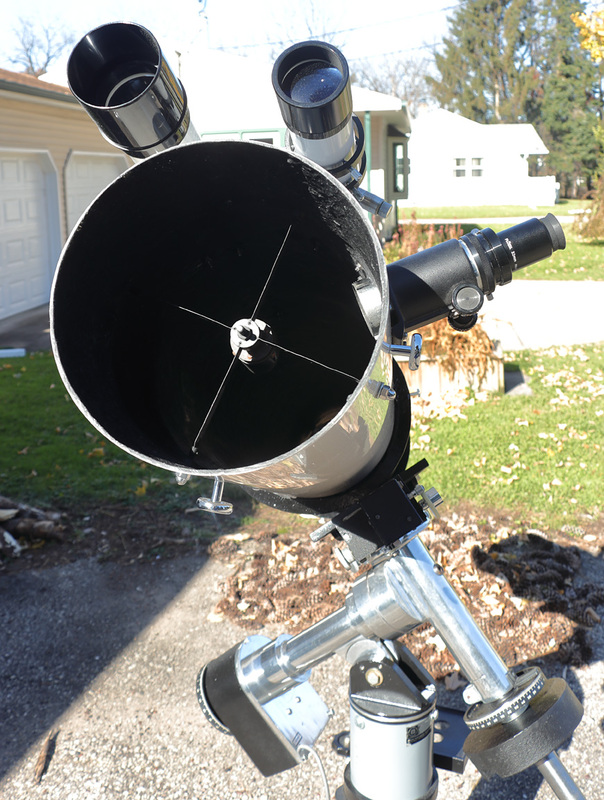 The finder scope is an older one from Orion, and the guide scope is an addition I put on there; an older Meade 60mm x 700mm. 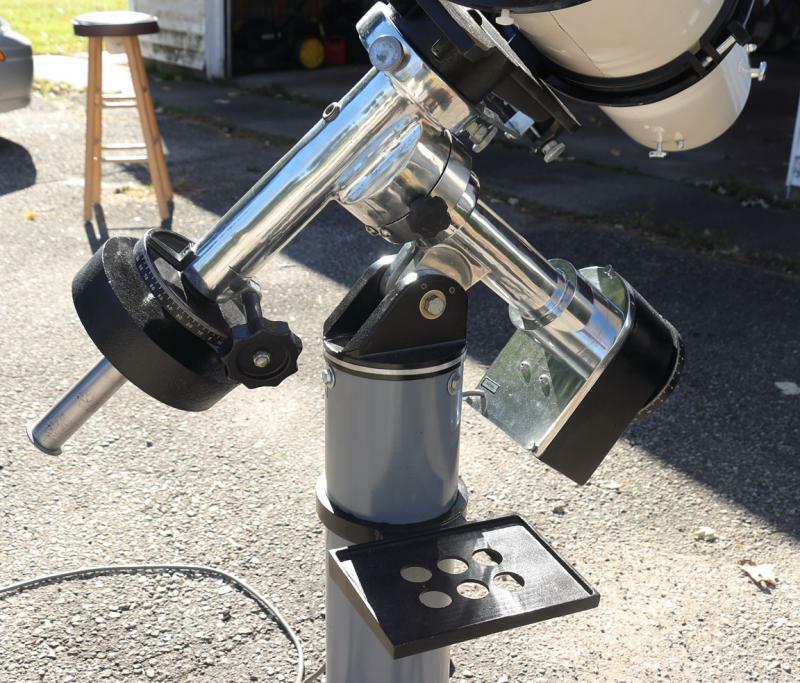 It's got a plastic focuser, and is not up to the level of the rest of the set-up, but it could be easily replaced with a better one. The coatings on the primary and secondary are not perfect, but I would not replace them yet if I were keeping it. I added a couple of plywood rings, which I painted black, to give it pseudo-rotating rings (I bought the metal rings new from Explore Scientific). It works quite well. I also replaced many of the bolts and other hardware with stainless steel, and put some chromed knobs into extra holes that were in the tube. I chose knobs that I thought looked like tiny primary mirrors (their focal length is about 25mm). The one thing I'm not finished with is the dual axis drive I hope to get to work with the mount. I have an AccuTrack 4000 that, as far as I know, works just fine, but I have to make a cord for the Dec motor. The 6-pin plug arrived in the mail today. 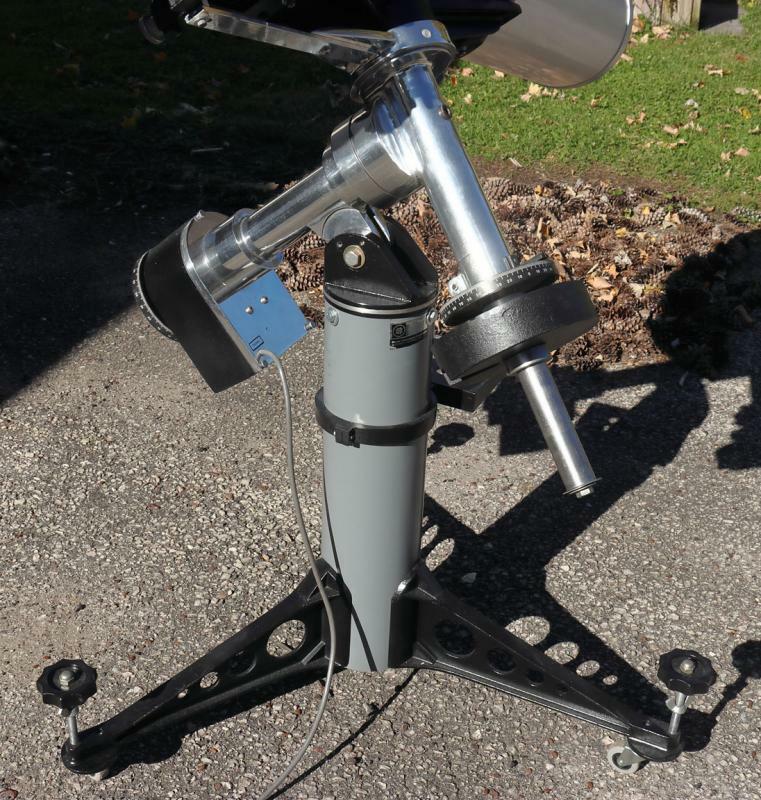 I asked in my original post about these three scopes what people thought this might be worth, and I guess I'm asking again for suggestions. I don't want to fleece anyone, but I also don't want to sell it for less than I can fairly ask for it. In my original thread, one of the folks who gave a values seemed to be saying what he would hope to pay for one, and of course we'd all love to pay as little as possible. The 8-inch sold for significantly more than the 'not worth much these days' suggestion I got. No doubt I'll end up doing other research, but this one is tough, since it's not a common kit. I can find lots of sold 10-inch SCTs on eBay to get an idea of what to ask for those, but this? The back of the primary and the cell. 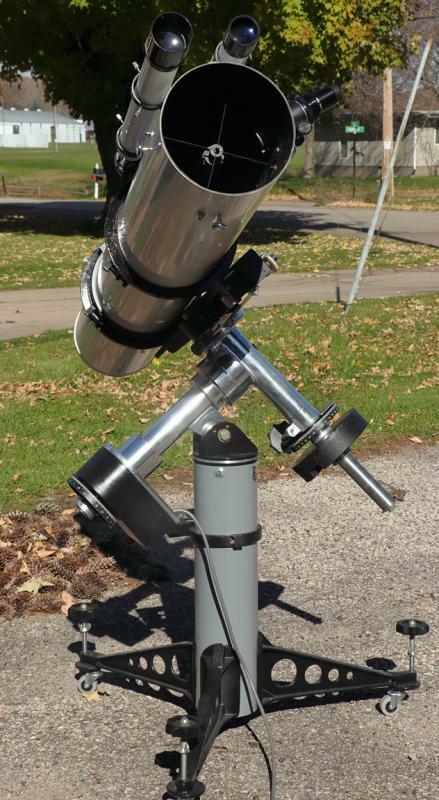 Folks in the original thread said both are Edmunds, and I was told by the person who passed this on to me (he did not make the scope) that the tube is from Parks. The Research grade mount. Apparently, the eyepiece shelf is often missing. Notice how the single counterweight is as far up as it can go. 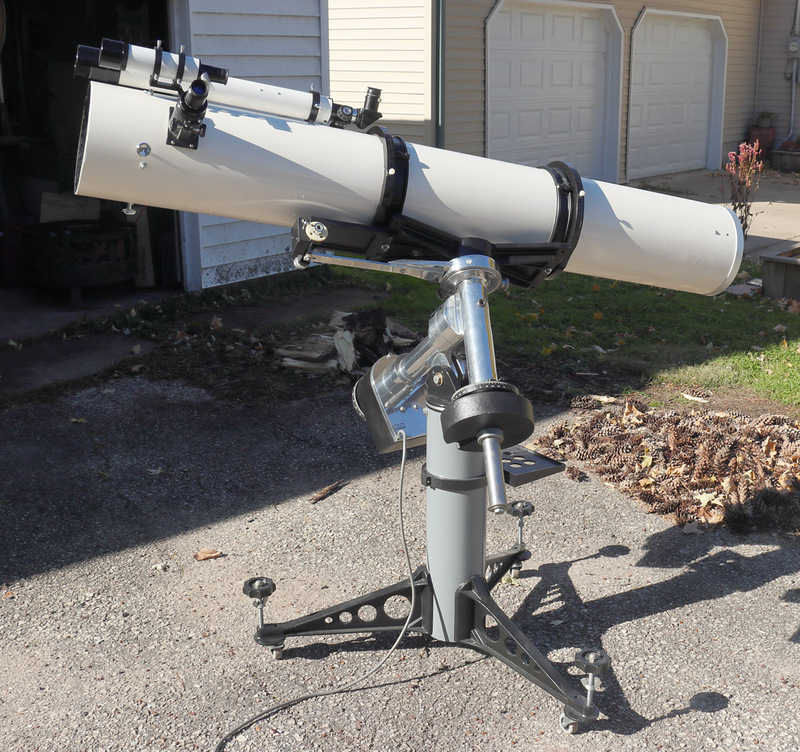 This mount came supplied with far heavier scopes. When I do sell this, I'm almost certainly not going to be able to ship it. It's just both too bulky, and too heavy. But I like to drive, and just got a 'new' (to me) minivan. I would break the door down to buy that if it was local. Nothing better than a 8" F/8 Newt. Best all arounder there is. I would throw out 700 big 1's in a beat heart. You did a nice job. I like the chrome on the mount. Gorgeous restoration Paul! It all looks just wonderful. Kudos! Excellent restoration!! 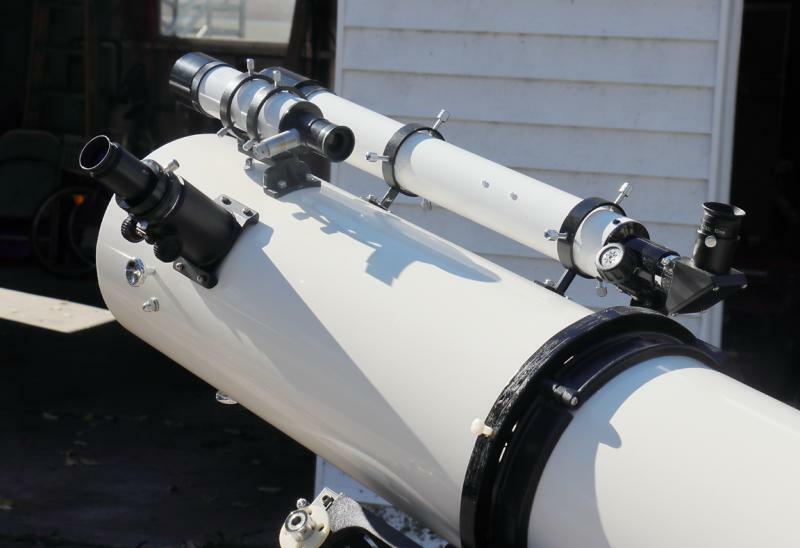 The mount looks exactly like my Meade DS16 mount, only mine is not as good looking! 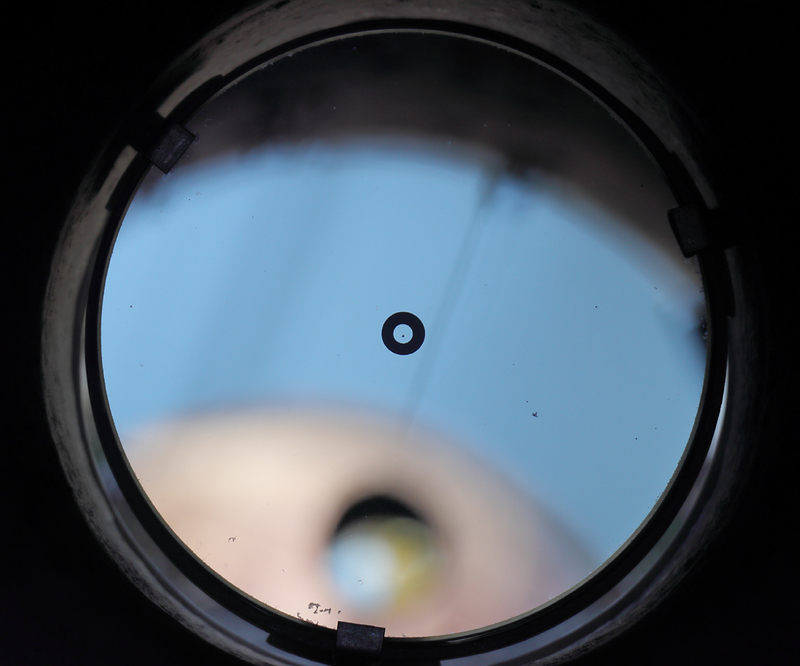 And the mirror cell is identical in design to my old, long gone 6" Edmund scope. Nice.. You should be standing next to the scope in a lab coat. Good job! Love that polished aluminum. Wow, it looks great. Nice job! I want that scope if you plan a trip to FL. Thanks, everyone! I was only able to get it looking this nice because of all the tips I've gotten from folks here, either through direct questions, or (much more fun) all the reading of others' threads that I've done here for years now. 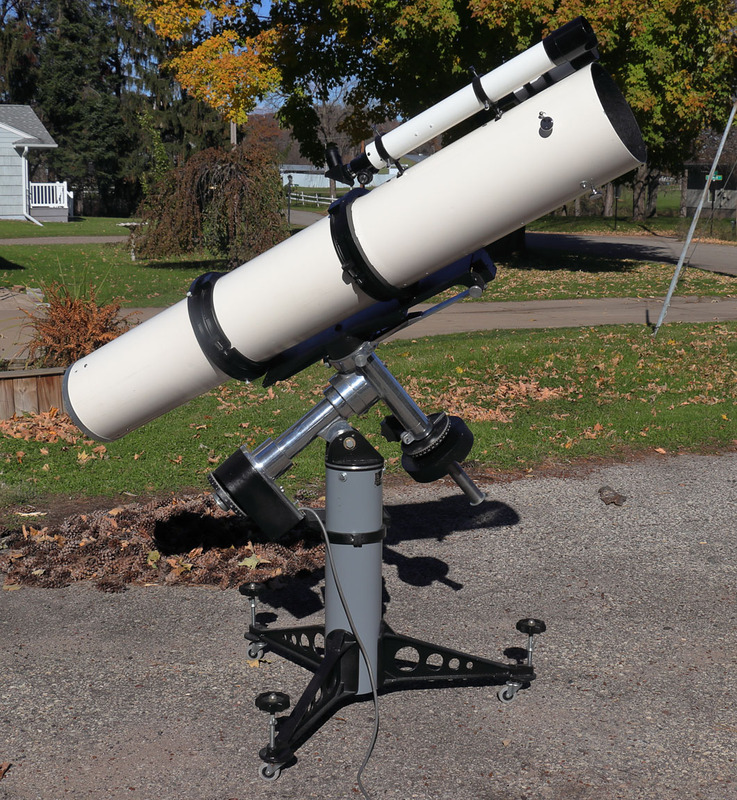 And, of course, the scope and mount themselves were made well and beautiful to begin with. It was so rewarding to clean away the decades of 'use' on both, to bring back the loveliness underneath. Chas: I'd bring the scope along if I had plans to head that way, but no such trip is in my future anytime soon (or even some time out). But thanks. Find a trucker than can take it with him if he comes to FL. The people on this site are amazing with all the useful help they freely give to anyone that needs it. 'Freely' yes, and with obvious enthusiasm, deep knowledge, and -- almost always! -- good humor. This is such a fun place to visit, and I just know that there are so many who do, whether or not we ever hear from them. You are all doing more than you might know to not only keep these great things from the past 'alive', but also helping to create the next generation of caretakers. 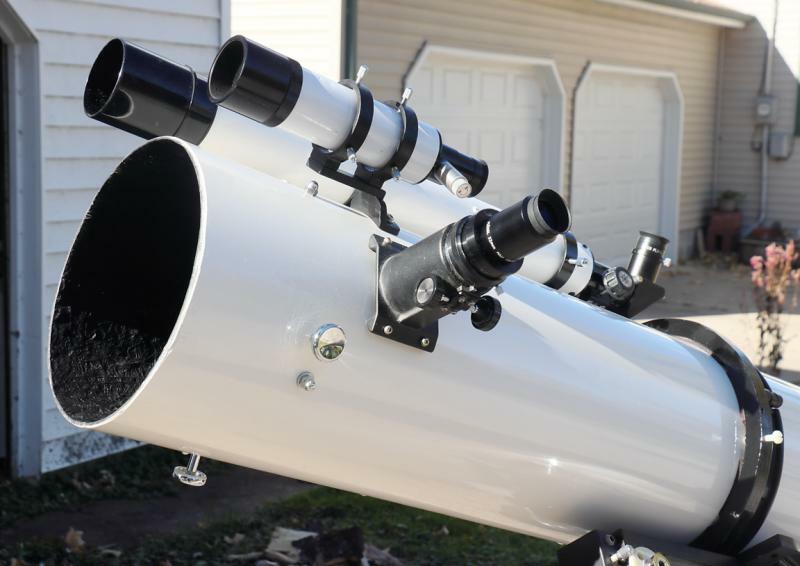 I have used these guys getting my Celestron 10 from a Seattle to San Diego and my Mom’s oil paintings crated and shipped as well. They pick up, build wood crates, ship, insure, etc. Not inexpensive but flawless service the times I have used them.